So you need a change. Turning your hair platinum white, pastel pink or some other dramatic shade definitely qualifies. Like all big changes, this transformation takes time and effort. Bleaching the hair removes the current pigment, so it's the first step for many hair-dyeing adventures. It's a job best left to a professional – but if that's not possible, take plenty of precautions before attempting to bleach your hair at home. Wait, isn't the point of bleaching the hair at home that it doesn't require a pricey trip to the salon? Maybe. But doing a DIY bleach job is risky enough to warrant getting a pro's input first. Schedule a trim and ask your stylist to recommend a bleach and developer. The latter comes in varying strengths, and it's really important to choose the right strength for your hair and bleaching goals. Your stylist (or the salon's resident colorist) should be able to help, but be prepared for him or her to warn you against undergoing this process on your own. While you're there, find out how much bleaching would cost at the salon. It may prove to be more affordable than you expected. If budget is the primary issue, look into salon services offered by local beauty schools. Services tend to be significantly cheaper than in salons, and students should be supervised at every step. 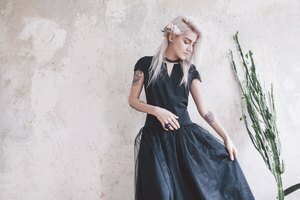 Thirty minutes in the bathroom isn't going to transform dark hair to platinum, and it's definitely not going to leave you with healthy-looking hair. Having realistic expectations is a critical part of bleaching hair at home. Some breakage will almost certainly happen, and one session may not be enough to strip the color out of dark hair. Bleaching does a number on hair. The healthier it is, the better it will look after bleaching. Spend a week or so doing regular deep conditioning treatments, and skip shampooing hair for a few days before the bleaching process. The hair's natural oils should help protect the scalp from irritation. Enlist a friend to help with the bleaching process to make sure you don't miss any spots. Work in a well-lighted, well-ventilated room and wear rubber gloves throughout the process. Follow package instructions to combine the bleach and developer in a bowl. Drape a towel around your shoulders and remove glasses and jewelry. Rub petroleum jelly all the way around the hairline and ears, which acts like a barrier to minimize the effects of bleach touching the skin. 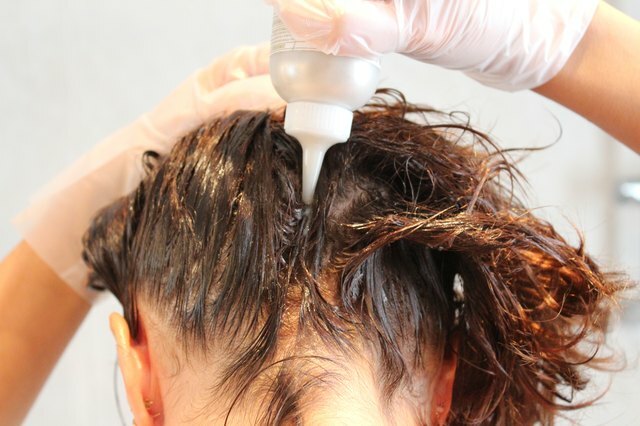 Paint the bleach mixture all over dry hair, making sure to coat every strand. Put on a shower cap and let the bleach sit for the time suggested on the packaging, but cut it short if you feel nauseated or uncomfortable. Shampoo the hair when time's up. Some DIY bleachers use toner after shampooing, which minimizes the yellow or orange tones that some hair takes on. Your chosen toner will probably have to stay on the hair for anywhere from five to 30 minutes before being washed off. Finish with a nourishing conditioning mask.